Exercises that stretch out the calf muscles help ease pain and assist with recovery. 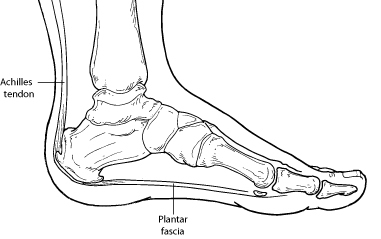 When you walk without shoes, you put undue strain and stress on your plantar fascia. Putting an ice pack on your heel for 20 minutes several times a day helps reduce inflammation. Place a thin towel between the ice and your heel; do not apply ice directly to the skin. Cut down on extended physical activities to give your heel a rest. Wearing a night splint allows you to maintain an extended stretch of the plantar fascia while sleeping. This may help reduce the morning pain experienced by some patients.